Just like VR, augmented reality too has been a technology that has shown immense promise. In the earlier phase of Augmented Reality, we were required to have specialized hardware, but now you can experience Augmented Reality on your smartphones. In this article we will understand what is Augmented Reality, which are two major Augmented Reality frameworks and how they work on our smartphones. Apart from this where you can find the implications of AR in real life. In simple words, Augmented Reality refers placing an interactive virtual object in the real world using a hardware such as smartphone, digital camera or computer. You probably might’ve played or heard of Niantic’s Pokémon Go, which was the perfect example of Augmented Reality technology. You use your phone’s camera and screen to view virtual objects imposed in real-time environments. So far you might have understood that what is Augmented Reality. So now we will talk about the basic difference between ARKit and ARCore. 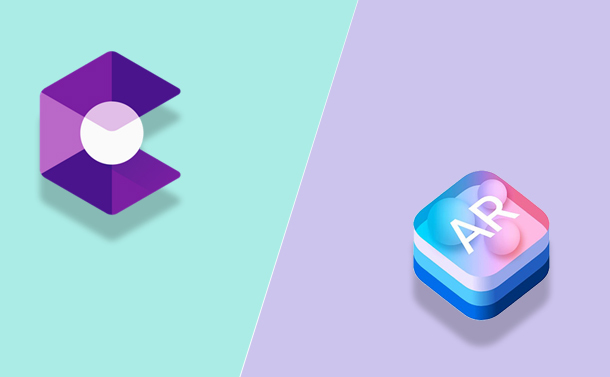 In simple words ARKit is iOS framework for Augmented Reality while for Android devices they call it ARCore. These frameworks help developers to develop better relationship between virtual objects and the real-world environment. ARKit combines device motion tracking, camera scene capture, advanced scene processing, and display conveniences to simplify the task of building an AR experience. What all devices support ARCore or ARKit? As we have already understood ARCore is for Android devices now here is the list of Android devices which supports Augmented Reality framework. If we talk about iOS Devices which supports ARKit framework then all the devices having A9 chip or higher supports Augmented Reality. If you are not sure about the Chip then here is the list of iOS devices Supports AR. With the help of applications supports augmented realty lots of things can be done few of them are listed here. -With the help of some AR apps you can place virtual furniture or interiors to you house which helps you to decide which one you should pick. -You can measure things in the real world with some of the AR Apps such as Scale for iOS. -Make your clicks funky with interactive AR objects such as your favorite superhero or celebrity. -Some applications show you information about real word things such as stars or articles in the museum. Some popular Augmented Reality apps. Ikea Palace: The application is for both Android and iOS devices it helps you to place virtual furniture in your Room. Holo: Place holograms of super heroes or celebrities anywhere and click photos with them. Measure: Measure can be used to measure real world objects. You can measure length and width of floor as well. AR Stickers: If you have a Google Pixel or newer Device you can check for AR stickers in the default camera app. AR Mole: it is like a mole bopping game for smartphone. Very simple but you will have fun playing it. So, this was how Augmented Reality frameworks work on your smartphone. Augmented Reality is really adding on new capabilities to our smartphones and now they are capable to do more than our expectations.